You enter the water at the inlet above the word "technologies"
- you exit on the beach above "2006"
Catherine Hill Bay is located just south of Swansea on the New South Wales Central Coast. Less than two hours from Sydney, this area is close enough to the city to be done as a day trip. If tides permit, you can dive the Swansea Bridge in the morning and do an afternoon dive at Catherine Hill Bay. Catherine Hill Bay is a coal mining village, with virtually all the buildings there small miners' cottages, built of weatherboards or later, fibro. There is a bowling club and the Wallarah Hotel. There does not appear to be any rental accommodation in the village. When I wrote this in the late 1990s the village had two mines still running, the Wallarah and Moonee Colleries. Now I think there is only the Moonee Collery. The Wallarah Collery closed down in the 2000s and there are plans to totally redevelop the village and destroy it all with housing. Back in the late 1800s and right up until the mid-1900s there were many more mines operating. The coal is very close to the surface, on the beach it is visible in the cliff and even part of the rock platform is coal. The coal was transported via a series of small railways to a wharf where it was loaded onto ships for the journey to Sydney. Today there is a newer wharf, much larger and longer, which has a conveyor belt to transport the coal to the ship. The village was apparently named after a ship that sank here in 1867. Today there are the wrecks of a number of ships in the bay, including the SS Wallarah, the Lubra and the Shamrock. Today divers visit Catherine Hill Bay to dive a number of sites. These include the Coal Loader, Desotos, the Wallarah and the area to the south of the loader. All of these are really only accessible via a track that passes through the Wallarah Collery's land. As such, it had a locked gate which means you needed to get the use of a key to open. The local dive shops had keys. However, about 2005 or so the company welded the gate shut and you basically cannot get there now. Even if the gate is open, the track has eroded so much to be impassible from what I have been told. To get to the site, follow these directions. If coming from Sydney or the south, take the off-ramp from the F3 that is sign-posted Toukley and Doyalson (I think). Go north along the Old Pacific Highway, past the Doyalson and Mumorah intersections. You will see the turnoff to the Point Wollstonecraft Sport and Rec Camp on your left and a bit further on the big prawn (at a service station). A kilometre or so past here there is a mining road off to your right that has no real signpost. There is a small sign that says Moonee Collery and Catherine Hill Bay, but it is on the other side of the road and is not really visible. If you miss the road, there is another well-signposted road (and the only legal access - the mining company can close the first road anytime it wishes) that you can take (see later). The mining road goes right towards the ocean and just before the Wallarah Collery the road turns left into the main street of Catherine Hill Bay. Go straight ahead into the collery and at the bottom of the hill there is a couple of roads off to the right. There is a small carpark here, take the road at the side/back of the carpark and this comes to a gate after about 100 metres. Meet here. If you are coming from the north (say Swansea or Newcastle), go down the Pacific Highway until you come to the well signposted road. This road goes through the northern part of the village, past the bowling club to the beach. 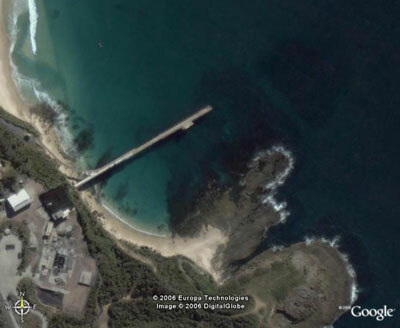 You can check out the water conditions by going behind the surf club to the start of the coal loader. The main road goes right and then left through the southern part of the village, past the Wallarah Hotel. At the top of the street, turn left and go down the hill to the abovementioned carpark. Make sure you are on time as once you have opened the gate and gone through, it needs to be locked after you. The dirt track is in very good condition and winds down to the point between Catherine Hill Bay and Moonee Beach. There is a grassed area here and this gives easy access to this dive site. Desoto Inlet is located to the south of the point. It is about 75 to 100 metres long and 10 metres wide for most of its length. The inlet gets its name from an old Desoto motor vehicle which was driven off the cliff into the water a long time ago. There are still some remains at the head of the inlet. In millpond conditions you can enter and exit the dive in the inlet but in bigger swells you cannot exit here. If you are entering and exiting here, then gear up and walk the 50 metres or so down to the water's edge. To your right as you approach the inlet there are the remains of a stainless steel ladder that has broken off. This is the best entry spot. I am not sure of the best exit spot, have a look. The bottom of the inlet is about 6 metres. Explore the head of the inlet, there are some large overhangs. Then head out towards the open ocean. The depth drops to 7 metres before coming up to 6 and then gradually dropping to 16 metres. The bottom consists of large rocks, with some kelp. The sides of the inlet are vertical, with some overhangs at the bottom. Follow the northern side of the wall to start. From 16 metres the depth comes back up to 11 metres before dropping to 12 metres. The bottom from 16 metres consists of small rocks and pebbles, millions of them. At the top of the pebbly slope, the pebbles are in waves, like sand often forms on the seafloor. This is about 10 minutes into the dive, less if you do not examine the head of the inlet. The depth gradually gets shallower but you should turn around once the wall becomes a slope rather than a wall. Once you get back to the top of the pebbly slope, go south to the southern wall. I have not done this so I cannot comment on this section of the dive. However, I would suggest following this wall for a while before returning to the inlet and exiting at your chosen point. An alternative is the above dive is to enter at Desoto Inlet and exit in the even smaller inlet to the north. To do this, gear up as above and then drive your car to the smaller grass area at the head of thed small inlet. Walk back up the track to your gear. After gearing up, walk to Desoto Inlet as per the description above and enter at the same location. Once you are in the water, explore the head of the inlet before following the southern wall. Once you come over the top of the pebbly slope (about 8 to 10 minutes into dive), keep following the southern wall. Go outside the bay and explore the wall towards the south. I have not done this so I cannot advise on what you will find. Go for 7 to 10 minutes before returning back to the top of the pebble slope. Cross over to the northern side. It will be about 23 to 30 minutes, depending on how fast you move. Follow the northern sand edge all the way. As indicated above, after a short distance the wall becomes a slope, with lots of kelp. The depth comes up very, very gradually from 13 to 11 metres. It then comes up to 9 metres and drops to 10 metres. The edge has turned from north-east to the north and then to the west. This is the start of the smaller inlet. If you come direct to this location, time will be about 28 minutes. If you have explored the southern side, it will be about 48 minutes. It will take 9 minutes to reach the head of the small inlet. If you still have air, you can explore the northern side of this inlet before entering the inlet. The depth comes up in a series of small increases to 2 metres. The bottom at first is sand but it then becomes large rocks covered in kelp. Exit the water at the head of the inlet. It is simple to climb onto the rocks here. Fishlife is quite nice in Desoto Inlet but a bit less outside. There are some yellowtail, silver sweep and some seapike. On the sand you will see flathead, Port Jackson sharks and small rays.